As a member or client of their services you are entitled to the same discount at Eddyline. 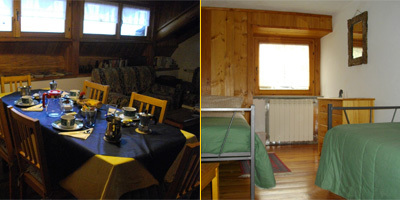 Walser style mountain lodge recently refurbished. Rooms for rent: single, double, 3 or 4 beds. Maximum capacity 16 guests. Sat TV, electric kettle, coffee, tea, private garden, reserved parking, BBQ, children’s playground. 16 camper pitches, large fields for tents, bar with Wi-Fi, restaurant/pizzeria, shower/bathroom/washing facility, children’s playground. 4 star hotel in prestigious 18th century mansion, completely refurbished enhancing the historical character with the modern designed interiors. 24 rooms including 11 suites, 7 Prestige and 6 Classic rooms all individual. Maximum occupancy 68 guests. Each room features TV, mini-bar, telephone. Wi-Fi in hall and common areas, 800 square metre garden. 2 business suites for 25/30 people + 1 multi-purpose conference hall for 50 people equipped with: projector, screen, flip board, overhead projector, TV, PC. 24h reception. 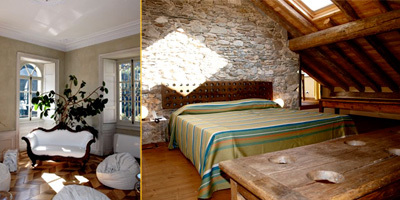 2 rooms accommodating 4 guests. 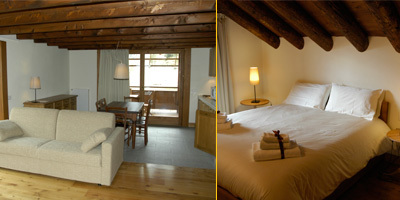 Characteristic stone and wood chalets with one and two room apartments for 2 to 6 guests each. Maximum capacity 70 guests, TV sat LCD, fully-equipped kitchen, hairdryer, child kit with cot, highchair, baby bath. Token operated washing machine, massage service, private parking, children’s playground, BBQ with tables, benches, chairs and loungers. Refuge at 1,409 metres above sea level. Options for hiking and climbing. 19 beds distributed in a dormitory and a bedroom. Typical mountain dishes and local produce. Seats 45 for meals. 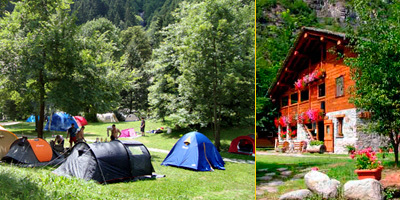 Renovated ancient mountain chalet, seats 50, option for more seating using outdoor marquee. Fixed-price and a la carte menu. Meeting hall for 30 people (to be agreed in advance). Sunday non-stop meals from 12:00 – 22:30, Saturday non-stop by reservation. 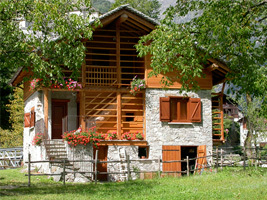 Typical cuisine from the valley, polenta, game, grilled meat, home-made desserts, speciality home-made pasta with game sauces. Situated in the Frà Dolcino theatre. 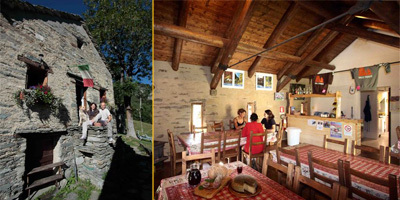 Typical dishes of the Sesia Valley, polenta, trout, game, speciality: local cheeses. Tourist and a la carte menu. International haute cuisine with nuances of Sesia Valley tradition. Seats 100 in 4 dining rooms + option of outdoor marquee in the summer, seating 80. On the banks of the Sesia River, access over a hanging bridge. Bar, games room, pool table. Pizza, speciality: kebab. Surf and wind-surf courses, Surf house, in Spain, Basque country, Cape Verde, Morocco, Canary Islands, Brazil, Venezuela, and Ireland. Indoor and outdoor sports climbing on boulder, rental of mobile climbing frame. in Sarnico (BG) on the Lago d’Iseo. Wind-surf and sail courses, sit on top and mountain-bike rental on site. Gré on the Lago d’Iseo. Everything to do with Telemark, Freeride, Skiing excursions, Alpine skiing. The helicopter is based in Verbania and periodically in Camptertogno for activities related to the Sesia Valley.